Debra Kayes is an artist, designer, and teacher at Columbia College Chicago. She earned a Bachelor of Science from Skidmore College, a Master of Fine Arts from the University of Wisconsin-Madison, and a Post-Baccalaureate degree in graphic design from Columbia College Chicago. 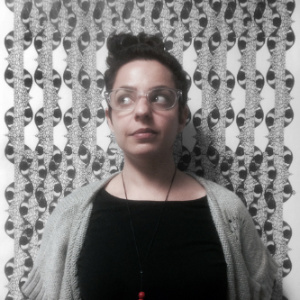 In her art and design work, she is greatly influenced by patterns. This ranges from repetition of shapes and marks in her paintings to designing surface patterns. She is the creator of placepattern, a pattern placeholder site for web code, the author of Pattern+Source, an online archive of multi-media surface design, and the author of Participatory Learning Strategies, a site for teachers to gain techniques on how to lecture less in the classroom. She has shown her art and design projects in venues such as the Illinois State Museum, the Museum of Contemporary Art Chicago, the Chicago Artists Coalition, and the Bemis Center for Contemporary Arts. She is a former Convergence Academies Research Fellow and Chicago Artists Coalition Hatch Projects resident.